Many people associate c-level execs with lives of privilege and luxury. While this may be the case for some (and although privilege and luxury are definitely byproducts of success), the truth is that many CEOs and business founders have overcome obstacles during their youth and early stages of their careers. But while others often see these obstacles as disadvantages in business, many believe they directly contribute to the success of top executives. From poor readers to dropouts, these unlikely leaders used their perceived deficiencies as assets to rise to the top of their industries. Let’s see if we can glean some inspiration from their pathways to success. CEOs are often viewed as visionaries with a particular genius for business. While that’s definitely the case, many CEOs have had to learn to cope with learning disabilities throughout their lives, and this coping is often the foundation on which their success is built. 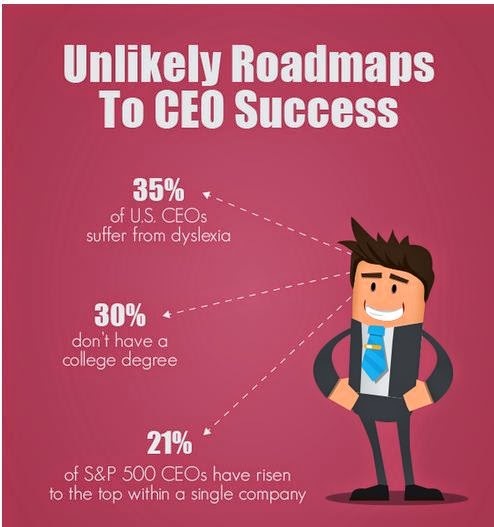 For example, studies show that CEOs suffer from dyslexia at a much higher rate than the rest of the general population. A survey conducted by the Cass Business School in London found that 35% of U.S. CEOs say they show signs of dyslexia. In comparison, only about 1% of managers and 10% of the general population are dyslexics. Famous business dyslexics include Apple’s Steve Jobs, Cisco’s John Chambers and Virgin Group’s Richard Branson. Many believe that their dyslexia is a foundation for these prominent businessmen’s rise to power. Yale University professor Dr. Sally Shaywitz argues that dyslexia is a business asset, rather than a handicap. Their necessity to cope with the learning disability set them up for future success in the business world. According to Dr. Shaywitz, their affliction has made them comfortable with failure, and while failure is never good in business, the ability to dust oneself off and try again after failure is a characteristic of a great businessperson. Dyslexics’ slow reading speeds have also helped them avoid distraction: it forces them to focus only on the essential information, and this ability to extract vital information in a world filled with distraction is an attribute that allows them to focus on growing their business. On top of that, their struggles with schooling forced them to reach out to others for help. This fosters trust in others to get things done, and this penchant for delegation is an essential attribute for those who run successful companies. Many people also believe that attention-deficit disorder (ADD) can be an asset for business leaders. Those with ADD have trouble focusing and get bored easily, and this motivates them to search for different and more engaging ways to deal with issues. These habits are attributed to creativity, and many believe that creativity is the most important characteristic of a great CEO. Likewise, qualities of Asperger’s syndrome have been found to be beneficial for computer programmers, a class of worker that has steadily risen to c-level ranks in the tech industry. A Business Insider column written by contributors for The Economist found that programmers’ interest in narrow subjects, their passion for numbers and patterns, and their penchant for repetitive tasks makes them great at what they do. And the greater they are, the more likely they’ll become successful tech execs. This, however, isn’t limited to the tech space. As quants take over suits in the world of finance, these high-functioning autistic traits have become a commodity in the industry. It’s no question that CEOs rake in tons of dough, but what many fail to realize is that a number of business magnates have impoverished origins. Proving that you don’t need an affluent background to become a force in business, many prominent business founders and CEOs have fought their way up from the dregs of society to become successful titans of industry. A great example of this is John Mitchell Systems’ John Paul DeJoria. DeJoria was born of German and Italian immigrants. By the time he was 9, he already had a job selling Christmas cards to support his family, and shortly thereafter, he was sent to live in a foster home in East Los Angeles. He joined a street gang before spending two years in the Navy, and when he returned from service, he lived in his car and banged around in odd jobs before finally getting into the hair-care industry. It wasn’t until 1980, when his friend John Mitchell suggested they start a business, did his career really take off. With the help of a $700 loan, he and Mitchell began selling shampoo and conditioner out of their cars. DeJoria now has a reported net worth of $4 billion. While DeJoria’s story certainly isn’t the norm, it isn’t exactly a rarity, either. Many prominent businesspeople have made a rise similar to DeJoria’s, including Xerox’s Ursula Burns, Starbucks’ Howard Schultz and Luxottica’s Leonardo Del Vecchio. And like those highlighted above with learning disabilities, these trailblazers used what others see as a deterrent as a foundation for business success. Psychology Today featured a Harvard University Press study that compared 60 “pathmakers” (i.e. those who overcame socioeconomic disadvantages and forged accomplished careers) with 40 similar people from privileged backgrounds. The study found that those with rougher backgrounds were more self-motivated and open to assistance, assets for business that are similar to those with learning disabilities. They were also found to be more likely to take advantage of career opportunities, meaning they were more open to leave jobs for better offers and to create jobs in order to build a niche for themselves. On top of that, like their dyslexic counterparts, they were familiar with failure and were better at transforming those failures into positive experiences. Overall, they were found to be altruistic, and this selflessness made them great business leaders. Similar to these unlikely stories of success, many prominent CEOs and entrepreneurs reached the top of their industries without the benefit of a college education; in fact, some were high school dropouts or didn’t even get a chance to finish elementary school. A 2012 study by the McCombs School of Business found that about 30% of all U.S. CEOs at the time did not have a college degree. We’ve all heard the stories of dropouts like Steve Wozniak, Richard Branson and Ray Kroc, and these teach us of the importance of being able to forge our own paths to accomplishment. Today’s instant-gratification society has seemingly made corporate loyalty a thing of the past. While it used to be relatively common for a worker to stay with a single employer throughout his or her entire career, the accepted career path of today seems to be bouncing around from job to job in hopes of career progress. But there are some present-day CEOs that prove corporate loyalty does pay. One such example is the aforementioned Ursula Burns. Born of Panamanian immigrants, Burns was raised in a New York City housing project. After earning a degree in engineering, her first gig out of college was an internship at Xerox, where she gained permanent employment a year later. In 10 years, she had worked her way up to Executive Assistant, and 9 years later, she was named VP of Global Manufacturing. In 2009, she was named the CEO of Xerox, becoming the first African-American woman to lead a Fortune 500 company. While they’re hard to find, these stories abound in the business world. Roger Goodell of the NFL, Rob Cavallo of Warner Bros. Records and Daniel Hesse, former head of AT&T, all started their careers as interns with their respective companies. In fact, a recent CEO.com study found that 32% of Fortune 500 and 21% of S&P 500 CEOs rose to the top within a single company, proving that both perseverance and loyalty actually do pay off in business. As these stories highlight, the best path to success is one dictated by yourself, not society. So stop reading about famous CEOs and start blazing your own trail to business eminence.